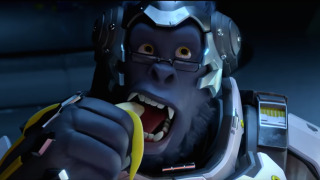 Blizzard's first animated short for Overwatch is the best way to get to know Winston, a moon dwelling, primate scientist gorilla. It also proves the game maker still has some storytelling chops. Titled "Recall," this is the first in a series of CGI animated shorts that will be released in the lead up to the launch of the new first-person shooter on May 24. While previous trailers and teasers have showcased Overwatch as a whole, these shorts will go in depth with the game's cast of heroes. The result? Something cinematically akin to a Pixar flick. Today's short gives us a fun (and adorable) introduction to the genetically engineered gorilla, as well as what could be the beginning of the Overwatch game as he gets in touch with (and possibly starts bringing together) the other protagonists. It's a creative and visually stunning way of getting viewers up to date with the game's lore and characters, which happens to be Blizzard's first original release in nearly two decades. That's right: not since StarCraft has there been a new offering from the publisher that wasn't related to or spun-off from one of its previous titles. We won't spoil anything more: you can watch the nearly eight-minute film below. Is Blizzard's upcoming shooter Overwatch the next Team Fortress 2?